SYED FARAZ MUJTABA is Partner of DAMSON Group and Partner & Regional Director of Corporate Business Learning UK for Middle East & Asia Pacific Markets. 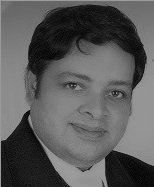 He has also been advisor to Experton Group AG (Germany), Orient Management Consulting (UAE), US Dept. of Justice, Government of United States, Dubai Islamic Bank (Al-Ain, UAE), E-Governance Academy of Pakistan, and various other organizations. Syed Faraz Mujtaba is among the global players in the fields of strategic consulting and business acceleration advisory for more than 18 years. He has worked in Middle East, Europe, Asia Pacific, New Zealand, and Pakistan at various business development and consulting positions in multinationals including MCI World Com, ASPGulf, Meta Group, Gartner, SBFC Group, B. Oliver Inc., Plan International and Experton Group AG. Blue Ocean Strategy, Competitive Strategies, and Organizational Neuropsychology are his focus areas and became source for his founding of various consulting groups, incubators, and startups. Faraz worked with Meta Group UAE as Manager e-Solutions and was part of its $162 Million acquisition by Gartner Inc. After a brief stay with Gartner Singapore, Faraz joined Experton Group AG in Germany, which was an off-shoot of Meta Group. Later he was appointed by Experton Group as Acting Country Manager for UAE and managed key commercial and government accounts including Ministry of Presidential Affairs Abu Dhabi, National Archives Abu Dhabi, Dubai Municipality, Dubai Chamber, Dubai e-Government, Sharjah e-Government, Dubai Courts, Dubai Airports Company, Dubai Aviation City Corporation, Emirates Air, Dubai World Trade Center, Emaar and Gulf News. Faraz also worked as Director Strategic Consulting with Orient MCT in Abu Dhabi and with IKMAS-ASPGulf for Microsoft Government Solutions to Dubai e-Government in Middle East. In Pakistan, Faraz has trained directors, managers and executives of prestigious organizations including OGDCL, Pakistan Mineral Development Corporation (PMDC), National Commission on Human Development (NCHD), National Council for Social Welfare (NCSW), Higher Education Commission (HEC), Rawalpindi Chamber of Commerce & Industry (RCCI), Human Development Foundation (HDF), SLS, E-Pakistan, Humsys Ltd, Berkeley Group, representatives from 30 national NGOs, and senior professors from 27 universities. Syed Faraz is founder of distinguished business concepts including Business Acceleration & Growth (BAG) Model, Micro-Blue Oceans, and 360 Degree Nucleus Branding. He has post-graduate qualifications in the fields of Business Administration, Marketing, and Applied Psychology and is author of 4 books. He is also a regular speaker at World Strategy Summit, Financial Technology Summit, Government Technology Summit, and Oil, Gas & Industrial ICT Summit, managed and organized by World Development Forum in Dubai, UAE.